Definitely a novel (sorry) approach to book marketing! I dropped Ryan an email and he kindly agreed to take part in a Q&A here on the blog. 1. Thanks for agreeing to this Q&A. Tell us a bit about yourself and your background. How did you come to write a book? I’m Ryan, I’m from Nottingham and I’m 21-years-old. I moved to Leeds almost three years ago now to do my degree – I studied Filmmaking at Leeds Beckett – and last week I finally finished it. I’ve always been a huge fan of movies. I love the escapism you get when watching a film, like nothing else exists but what’s on screen, and I found it fascinating how much I cared about the characters and settings, even though I knew none of them were real. I guess I wanted to create a story of my own, to make something that other people can get drawn into and care about, and another world I can escape to myself. The first book I ever wrote (which I haven’t let anyone read) was about a teenage spy/computer hacker. I’m a big fan of spy films like James Bond and Jason Bourne, and thought it would be cool to make my own version of that, but with a younger, cooler character. 2. What’s the book about? 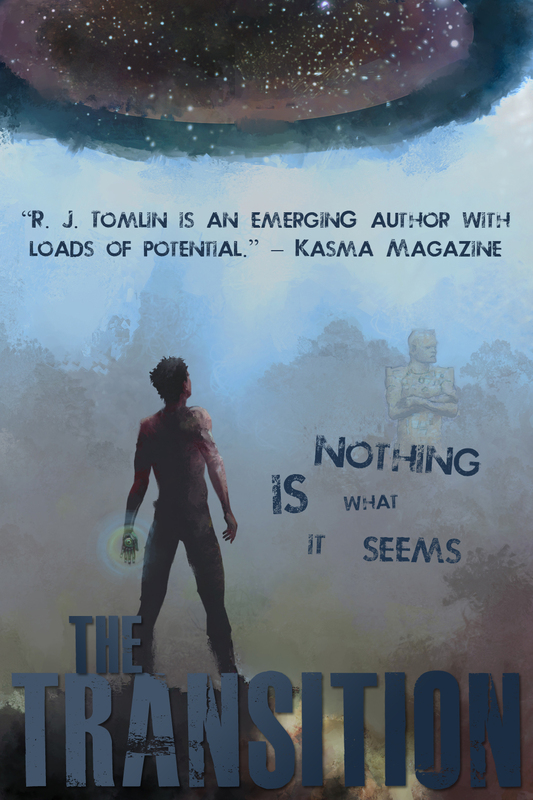 The book I’m promoting at the moment is called “The Transition” and is a sci-fi, dystopian story about an alternate society where children are raised separately from adults, in order to form their own beliefs and identities. They’re raised in a facility until their late teens, and on their eighteenth birthday they meet their parents for the first time. 3. What drew you to the genre? I’d read books like The Maze Runner, and also seen various films like The Hunger Games and The Island. I liked the mixture between slick, futuristic technology and bare, rustic environments, and thought creating an alternate society would also be something cool and exciting to explore. 4. Did you always know you would self-publish, instead of seek a traditional contract? I’d written five books before this one and sent all of them to various publishers, all of which got rejected. After writing this book, I believed in it so much that I didn’t want to send it off just to get rejected again, I wanted to share it with the world and show people what I’d made, so I self-published and went about marketing it myself. 5. Do you proofread / edit your own books or hire someone? Do you do your own covers? I occasionally get friends and family to look over my work to check for grammatical errors, but the vast majority of the proofreading is done by myself. All the editing I do myself too, which is something I’m very proud of! I design my own covers as well – the artwork for this one is actually something I found online. I contacted that artists and he let me use it for the cover. 6. It’s the first time I’ve ever seen anyone promote their book like this! How successful would you rate your marketing techniques? What’s the response been like from the public? What types of people have come forward or spoken to you about your book? 7. Who would you say are your favourite authors? Any literary heroes? 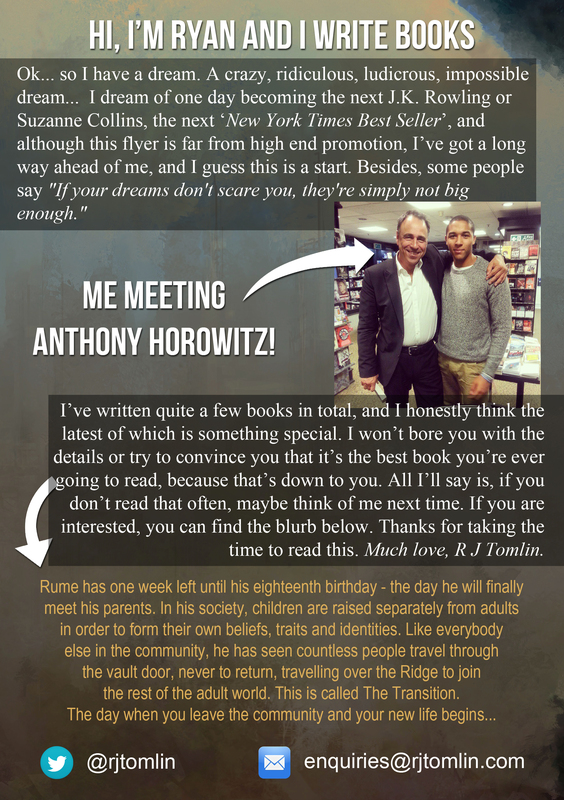 My favourite author of all time is Anthony Horowitz. I don’t often tell people, but I used to absolutely hate reading as a kid, I thought it was boring. But one day in the library I picked up an Anthony Horowitz book and, as soon as I had started reading it, I couldn’t stop. I realised it wasn’t reading I hated, but rather the books I had been reading. I’ve read about 20 of his books so far and they’ve all been fantastic. 8. I love your sign – hoping to be the next J.K. Rowling – if you could ask her one question, what would it be? I’d like to think I’d ask her something deep and mystical about writing, but in all honesty I’d probably ask her what her favourite book is and why. It would be great to know what inspired someone who’s so inspiring themselves! Thanks Ryan, and good luck with the book! If you do become as famous as JK Rowling, don’t forget us! 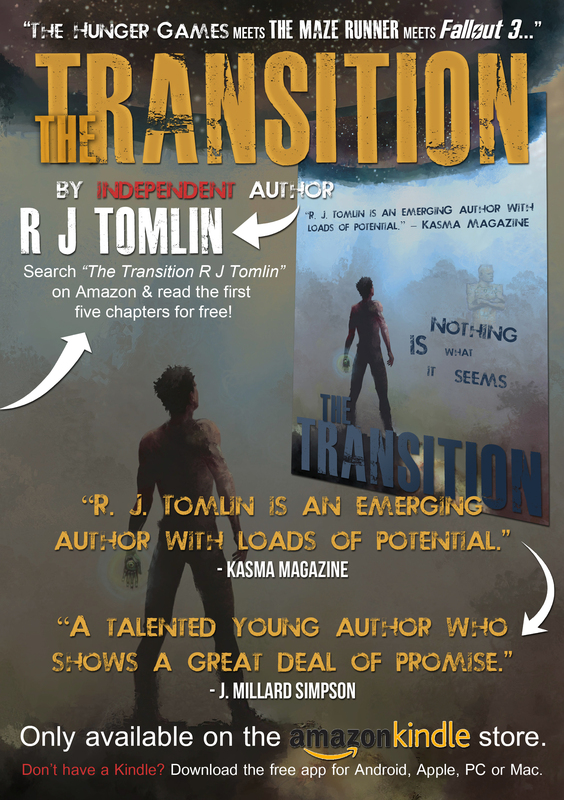 The Transition is out in ebook now and has had some fantastic reviews! You can follow Ryan on Twitter @rjtomlin or on Instagram. Great post! Couple questions – Ryan, how did you psych yourself up for this (or did you not need to!) and was it a scary thing to do? I have to say, the first time I did it I was pretty scared. There were so many questions going around my head and I had no idea how people would react. But I realised that my excitement and determination completely outweighed my fear and that, if I didn’t at least try, I would regret it at some point.